I thought I’d give you a little tour of my studio; it’s nearly all set up for my studio sale! When you get to my house (3015 10th Avenue South, Minneapolis), you’ll be greeted by my Pottery signs! You can enter through the front, or the back (there is a parking lot across the alley from us that you can park in), and then find your way to the back door. Enter there to go down to my basement studio! There will be lots of extra signs too! I’m located near the Midtown Global Market in the Powderhorn neighborhood of South Minneapolis. There is plenty of street parking, as well as easy access from the Greenway and public transportation. There is a craft fair, No Coast Craft-O-Rama, happening on Saturday at the Market, so you could stop by my studio sale and the craft fair and get all your shopping done directly from independent artists! Once you get down to my studio, you’ll see shelves and shelves of pots! And they will all be 20% off! I’ll have plenty of yummy things to eat and if the kids come with you, there is a hang-out area for them next to my studio with toys and Christmas movies playing (although they’re welcome to hang out with you too!). Lots of handmade porcelain dinnerware, glazed in celadon. If you’re one of my customers who collect it, this sale is the perfect time to add some new pieces to your collection! I’ve been having fun adding some new colors into my work. And some new forms like the travel mugs on the top shelf with silicone lids! I have some soda and wood/soda fired pieces too! And the final photograph (although not the end of the sale!) is my “Etsy wall.” Everything here is up for sale on Etsy, but you can still buy it from me during my studio sale! I just keep them together, with a piece of blue tape on them to denote that they are listed online. I want to take down a listing ASAP if someone purchases it in person! I have to keep nice and organized when I’m selling items online and in my studio. What is NOT photographed yet (because it isn’t set up yet! ), is my Seconds, Samples and Discontinued items! They are already marked down 50-75% off, and then you’ll get another 20% off on top of that! They are priced to move… because I am ALWAYS making more! And back to the topic of Etsy… my online sale is going on until December 18th! I’ll continue to add new pieces to my shop until then, but just know that things are moving quickly! Use coupon code JINGLE to get 20% off your online order (excluding custom orders). Plus $5 shipping for each address! So that is the tour of my Studio Sale… or at least the part that is set up! Feel free to share this with friends and family who live in the Twin Cities even if you don’t! I sell online and through galleries throughout the year. But this is the one time of the year where I can connect face to face with folks and I really love it! I hope to see you this weekend, in my studio, or online! In the studio and out of the studio. I know it has been a while (too long…) since I’ve posted here. I have been busily working away in my studio and spending time with my family. Life has been good. But something had to give, and it was the blog this time. I’ve been overwhelmed with blog updates that are only in my head, and way overdue updates to my website. So I’ve just been hiding from it all. That’s the best way to deal with things, right? Anyway…back to the pots for a moment! Here is a favorite pair of mugs from an earlier firing. Creamy yellow mugs with interwoven circles by Emily Murphy pottery. Glaze fired to cone 10, decal firing. Since I’m gearing up for a busy holiday season, I just finished several back to back glaze firings and decal firings. I’ve been photographing, sanding, measuring and packing up pots and sending them out to various corners of the country. It’s definitely the busiest time of the year for me, and most potters! And for a non-studio update… This fall I got myself a new sewing machine and decided I should break it in by making some super fun Halloween costumes for my daughter, Ada and nephew, Shiya. I tried to have this post up the day before Halloween, but ended up having to do a big blog overhaul to fix a bunch of things that was causing problems. Luckily it is almost all fixed and working again! Both Ada and Shiya picked out the themes of their costumes. I present to you: Ada Rainbow (as she called herself!) and Shiya the Most Awesome Viking Warrior ever (also his self appointed name). I love how Ada was mimicking Shiya’s fierce look. Does that make her a fierce rainbow? The rainbow is all felt. It’s a mirror front to back. We found oodles of images online and I made up my own pattern to fit Ada. It’s basically an a-line dress with straps. And I found a long sleeved red shirt at the 2nd hand store. The awesome rainbow hat was one that we already had from Zulily. Shiya’s viking costume was super fun and came together really easily. We live near the Midtown Global Market where there is a little Swedish/ Scandinavian shop that always has viking helmets! I got a nice neutral shirt and sweater from a 2nd hand shop. He already had a pair of brown pants. The rest are layers of fur, felt and leather. I found some really cool bronze buttons to attach his fur cape together. My favorite part is the fur wrapped boots. I just wrapped the fake fur around his boots and wrapped some leather cording to secure it on. Such an awesome look… I might need to steal it for my own boots! Same thing was done around his arms. Anyway, it was the perfect Minnesota Halloween costume. Nice and warm! And while we’re on the topic of handmade costumes… Last year Ian and I made the kids’ costumes together. They were both owls. Really adorable owls. Ada the owl… She’s grown so much this past year! And yes, those are owl sneakers on her feet! We made our own owl faces with felt onto fleece hats. And used lots of different patterned fabrics to make up all of the feathers… so many feathers! When I was a kid, we always made our Halloween costumes (except for 2nd grade when I really really wanted a store bought Strawberry Shortcake). I think it instills a love and excitement for handmade things at an early age. Ok, back to the pots….Here are some photos from my earlier firings. I realized that I never posted these! Some of these will soon be up in my Etsy shop or are already on their way to a gallery near you! So that should catch you up just a little bit as to where I’ve been during my absence from this blog! And even though I haven’t been blogging, I do keep my Emily Murphy Pottery Facebook page pretty up to date! It’s a little easier to post a photo as I’m working. I’ll be posting more soon now that my technical difficulties are mostly resolved. Hope all has been well in your corner of the world. 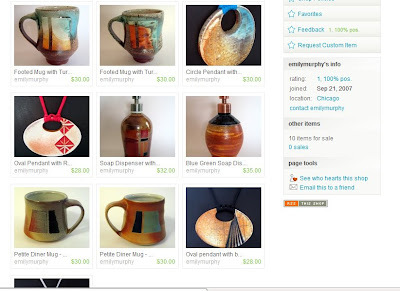 Emily Murphy Pottery Etsy Sale! It’s up! My Holiday Etsy Sale is live! Don’t miss out on the special $5 shipping sale! Mugs, plates, bowls, soap dispensers, little dishes… Everything is ready to be shipped! At the moment, I’m only shipping in the US, but if you’re somewhere else, send me a note and I can see if we can figure something out! Finally! My Etsy shop has pieces in it! I’ve had an Etsy shop for more than a year, but it’s been an empty store. No more. I’m starting to stock it with pendants, mugs and soap dispensers. New additions will be up daily over the next week. I’d been putting this off for a long time. I kept waiting to have the perfect photo set up and a little more time. Then I realized that I should just jump in. Those things can come later. I’ll be posting new pieces in the coming days. I’ll keep you posted.